It’s Diabetes Awareness Month, as well as National Family Caregivers Month, so Semisweet is sharing its first guest blog, an interview with parent caregivers, Kevin and Rebecca who are parents to Everett. Everett was born at 33 weeks, and a few hours after his birth, Kevin and Rebecca learned Everett has Down syndrome. Infants and children with Down syndrome will experience delayed milestones, like rolling over, talking, standing up, and walking. 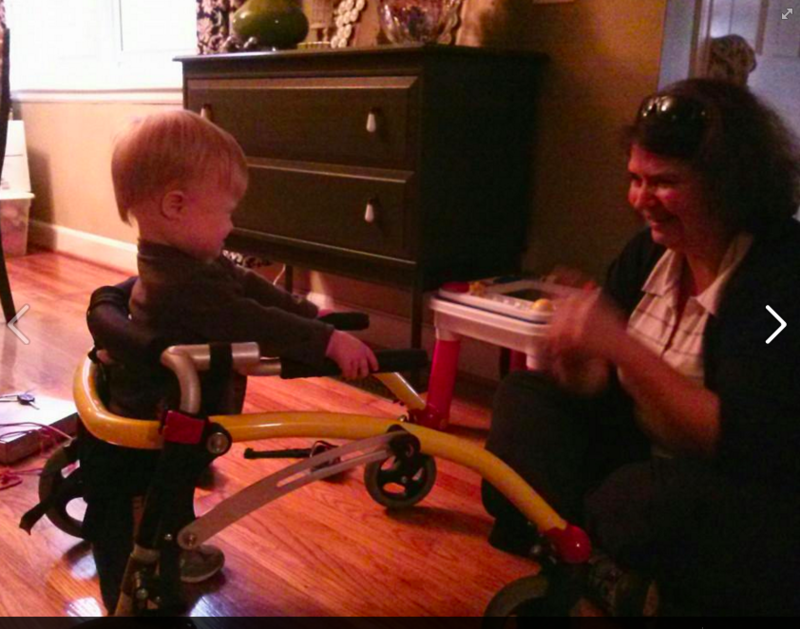 Here’s a Facebook status that Rebecca posted last week: I was multitasking during Everett’s PT visit, and while the physical therapist was here, I was attempting to cook dinner, but Everett was using his walker, and I got so excited. Kevin and the girls got home right in time to see the firetrucks pull up. Good to know that the fire alarm works. No fire, lots of smoke, but Everett stood up on his own. We ate leftovers to celebrate. What’s a tame little kitchen fire when your child stands up for the first time? Everett standing up with the help of his walker. How would you describe your child’s condition? Rebecca: My child has Down syndrome. Down syndrome doesn’t have him. It is just part of him and doesn’t define him. It is part of his person. Because of the additional 3rd copy of the 21st chromosome there are certain (daily) things that we need to be mindful of as far as health, learning, or daily living. Everett is smiling, has red hair, has DS, and loves to play with cars. What care for your child is required, and how do you and your partner divide this care? Rebecca: Because I was off work for almost two years the scheduling primarily falls on my shoulders. When I returned to work, I kept that responsibility since my husband works a second job to supplement our income. I make his weekly therapy appointments (averaging around 4 appointments a week). Friday is therapy free, so Friday is fun day. About once a month I try to accomplish a bigger long term goal involving support groups, advocacy, funding issues, or later life care. What impact has being a caregiver had on your relationship? Kevin: It has not made it harder. It is the mindset we have chosen. It is just giving extra opportunities to Everett. In no way has it weakened our marriage. How has being a caregiver changed your relationship? Rebecca: It reinforces the fact that we are a team. Describe a caregiver technique you and your partner do differently. Rebecca: Kevin will carve out time and work on a skill that a therapist is asking us to do. It is direct instruction. I will normally have the kids around me and we all do it together and I just try to integrate it into our play. In twenty words or less, describe your partner’s caregiving superpower. Rebecca: Kevin’s superpower is his love for his children, from our first baby to our fourth baby. Kevin: Rebecca’s superpower is the ability to keep everything going.